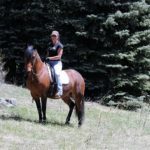 Micaela Gies and Luke Baumann have teamed up to start a new horse training and riding lesson business in Conifer called Double Header Performance Horses (DHPH). They are leasing a twelve-stall barn at the long time boarding and training facility at 23615 Oehlmann Park Road. Micaela grew up in the Evergreen area and started riding at age nine with well-known local trainers Julie Phillips and then Beth Mathis. She started showing on the 4-H circuit in all-around and then the Colorado Hunter Jumper Association circuit in Hunter Under Saddle and Hunter Over Fences. She also worked with AQHA trainer Jerry Olson and worked as a summer riding camp counselor under Corrine Lettau at Denver Equestrians. Committed to learning more and to honing her horse training skills she earned her AAS in Horse Training and Management at Lamar Community College, one of the top schools in the nation for their horse training program. She started three colts during that time and specialized in training another colt in cutting. In spring of 2013 she did an internship with Reining trainer, Mark Guynn. While there, Micaela became drawn to the bond and trust that the horse and rider must have together to execute the Reining maneuvers with the rider guiding the horse mainly off of seat and leg pressure. From that point, she decided that she wanted to focus her training on Reining. Much like Micaela, Luke has a broad and balanced background in a variety of areas. Luke also received his AAS in Horse Training and Management at Lamar Community College, starting three colts and specializing with a colt in cutting and team roping. He has a love for roping and spent college weekends roping on the college rodeo circuit. His affinity for team roping earned him an internship with Nick Pullara at Pullara Performance Horses in Fountain, Colorado. 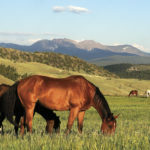 Luke has also dabbled in bull riding and bronc riding, but after working with James Morgan of James Morgan Horsemanship in Bennett, Colorado, he realized he wanted to use his skills in natural horsemanship to train and help people with their horses. You will find that Luke and Micaela compliment each other perfectly. They are known to take the time with horses and people, training correctly with a solid foundation to build on in any discipline. 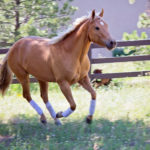 Their training is rooted in natural horsemanship because they work with the horses natural character and instincts to create the ideal all around horse that has the mind to happily do whatever job is asked of them. They consistently change their training routine to keep their horses fresh and well rounded. Not utilizing one training method over another, they combine them and use what is needed to best fit each individual horse and/or rider. Micaela and Luke offer horses to part or full lease! What is leasing? Do you have a horse crazy kid or are you horseless? Leasing is much as it implies. You are paying an amount to have use of a horse much like it is your own, but you don’t have the initial cost up front and the monthly bills are smaller. Plus, with DHPH a weekly lesson is included. Luke and Micaela are offering the following two opportunities at a minimal cost to come try them out next month or give as a Christmas present! Plus, if you don’t have a horse for the horsemanship clinic, they have one for you to lease for the day. As a wanna-be roper, I plan to go to the roping clinic for sure! Horsemanship Clinic – Saturday January 10th, 9am-12pm, ready to ride at 9am. 6 participants max. $50 BYOH, $75 lease horse for day. Beginner Roping Clinic – Saturday January 17th, Registration starts 8:30am, Clinic 9-11am. No horse needed. $20. To learn more go to http://dhperformancehorses.webs.com/, find them on Facebook or call Luke at 303-993-9038 or Micaela at 303-918-6367.